If you're anything like us, the first thought that comes to mind when attending a wedding is probably "when and what are we eating?!" Food is a huge part of wedding celebrations, setting the tone for the whole event. Great food can catapult you squarely into the "Best Wedding Ever" category, whereas lackluster eats can leave guests feeling unimpressed, disgusted and worst of all, hangry. We polled our team of foodies for what they wish they had known on their wedding days about our favorite part of the celebration - the food! The reward every wedding guest is looking forward to after sitting through a ceremony is the delicious meal afterward. Let's be honest, as happy as everyone is for you about your nuptials, yummy food is something they get to experience personally. Treating your guests to passed hors d’oeuvres post ceremony is a gesture everyone will appreciate, and helps make the transition from ceremony to celebration. It's not ideal to expect guests to wait for the ceremony, cocktail hour, and speeches to conclude, before finally enjoying a dinner served after 9:00pm. You can also score a few bonus points by allowing guests to choose their entree on the spot (a food truck catering perk! ), rather than a month in advance. Because the only thing worse than being hangry, is being hangry with a side of order envy once your entree arrives. 2) ...And So Will You. But You May Not Have Time to Eat! While your wedding day is one of the best days of your life, it can also be pretty hectic. You'll be swarmed with well-wishers at your reception, eager to compliment you on your new marriage, your rings, the ceremony, your dress, the venue, inquire about your honeymoon plans, reminisce about their own wedding...you get it. It's hard enough to answer all these questions between bites of food and thanking your guests for coming. Then there are the challenges of trying to eat without getting food stuck in your teeth, dropping anything on your dress, and trying to stay contained within any expertly fit shapewear! We recommend eating a little snack as you get ready, and requesting a to-go box of your entrees in advance. You can find time to eat before you officially enter your reception or at the end of the evening. Also asking someone to stash to go boxes of cake in your getaway car is a MUST - you’ll thank us when you’re enjoying a nice little honeymoon suite snack! Your wedding is a special day you want to cherish forever, so when the time comes to make decisions it's natural to want the very best of everything. That perfect venue calls for an equally perfect dress. Your wedding party needs to look as beautiful as you do, which means stunning gowns for the ladies you love most. Then there’s your handsome groom and his groomsmen channeling Justin Timberlake’s “Suit and Tie” song with impeccable threads. Since the ante has been upped for every other wedding detail, you also need the fanciest reception food to blow away your guests, right? The truth is, if your budget is on the tighter side, a luxurious menu can send you far beyond what you originally planned for. You don't want to disappoint… but does anyone even like snails or foie gras? We’ll let you in on a little secret: your wedding guests will be most impressed by great food that means something to you. We're huge fans of incorporating ingredients or dishes that carry special meaning for the two of you. Food truck catering easily allows for customizations like naming your food "first date pizza" to commemorate cute moments of your relationship, or the incorporation of ingredients from both families heritages. These are thoughtful ways to keep costs down, while making your event unique and personal. Be guided by the food and flavors you love, and don’t feel pressured to select the priciest options because you feel like this is your "one chance" to host a fancy party. Our team of planners is here for you! After months or even years of planning, it can be really hard to stomach the idea of handing responsibilities over to someone else. One of our recently married brides admitted, "I was kind of a control freak, I wanted to be involved in and handle everything. Then suddenly on the day of, I just didn't care about handling any of the problems that popped up. It didn't matter if the reception room blinds were closed, or how my relatives who drank too much were going to get home, or that my maid of honor suddenly decided she needed an alternate dessert because she wasn't eating gluten that week. I just wanted to enjoy myself. Thankfully our venue came with a coordinator, so she and her staff took over and handled everything to perfection." We're all in agreement: save your sanity, and delegate! An on-site event coordinator can ensure trash cans are being emptied regularly, attend to any staff issues or guests who have unforeseen needs, and handle emergencies without tearing you or your family away from the festivities. Be sure to ask us if you’re interested in hiring an event coordinator, odds are they'll smooth any issues over before you even know there is a problem. So. Worth. It. 5) When It’s All Over, You’ll Be Hungry Again. "When my husband and I got back to the hotel after our reception we immediately ordered a pizza. Which is funny when you think about how much money we had just spent on food," - we hear this all too often. Your wedding appetizers and entrees may be wonderful and plentiful, but drinking and dancing throughout the night will keep your appetite at an all time high. We recommend a substantially stocked dessert table of doughnuts and cupcakes that guests can nibble on towards the end of the evening. 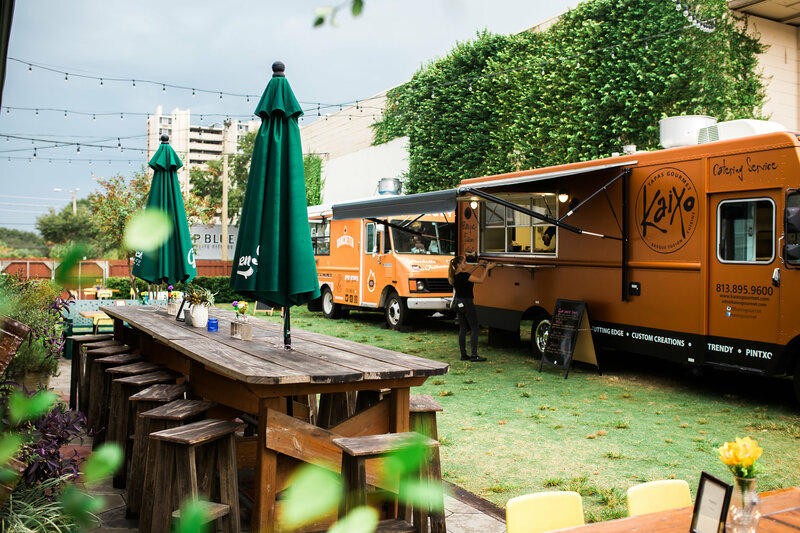 Alternately, rolling in a food truck serving late-night snacks like mini pizzas or tacos is fun and unique addition to your event that will help fuel your guests into the wee hours of your celebration. Interested in learning more about catering by Tampa Bay Food Trucks? Click here to chat with one of our planners.